You should have just left stop number 15 on the Pals Hop - Nancy Gleason at MyStampinSpace. If so, you are in the right spot. If you get off track, the full blog lineup below will help you move along from blog to blog so you see all of the amazing creations. Share Christmas joy and your best wishes for the new year with cards you make yourself. Some cardstock, a little bit of ink, and this stamp set are all you need. The price of silver keeps going up, and the value of your projects will go up too when you use these beautiful foil sheets! Can be embossed, cut with punches or Big Shot dies. Create beautiful scripted backgrounds for cards, gifts, and more with the Pretty Print Textured Impressions Embossing Folder! Get on top of the metallic trend with beautiful silver stamped images using the Silver Metallic Encore Pad. Love cool tools? Quickly and easily create custom envelope liners to match your handcrafted cards with the Envelope Liner Framelits Dies. Gorgeous rhinestone-adorned embellishments are the perfect, finishing touch for cards, packaging, and more. The next stop is Linda Callahan at Stampin' Seasons, stop number 17 on the Pals Blog Hop! I know Linda will have an amazing project to share! Thanks for visiting – and I hope to see you next month! Wowza - beautiful card - love the embossed silver sheet! Thank you Linda! I love the new silver sheets! Beautiful, Beth...the embossed foil sheet is a perfect background for the elegant pointsettia! 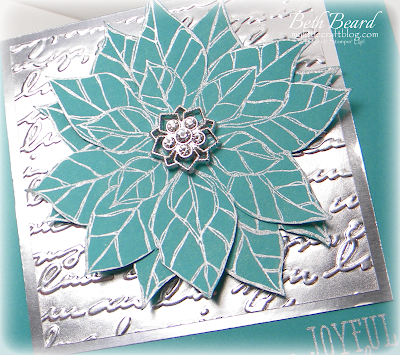 gorgeous use of the embossing folder. 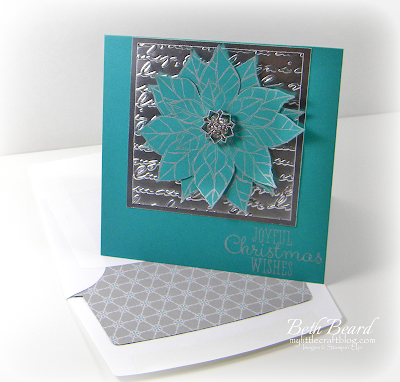 The silver is stunning and the embellishment is icing on the cake - oops...card! One beautiful,special work of art from your heart! You're so sweet Susan! Thank you! Stunning is the word that immediately comes to mind! 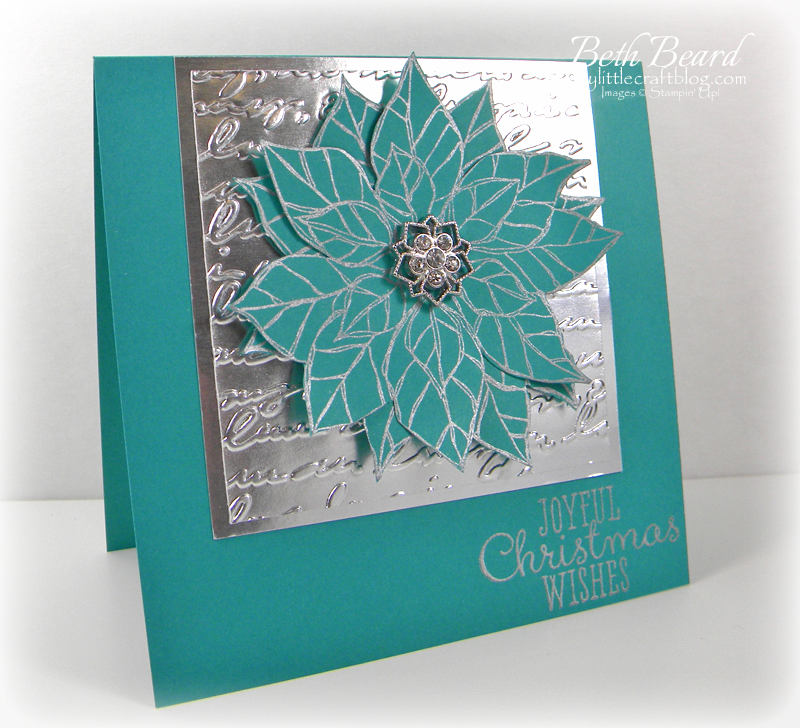 That card really packs a punch (or embossing folder)! Beautiful!! Wow! Great color for your Poinsettia, especially against the silver foil paper. Oooo, so pretty! I love the silver embossing on the Bermuda Bay it's so striking. That embossed foil sets the whole thing off. Another gorgeous card! Thank you Dawn! I really appreciate it! I love the embossing on the foil sheets! So pretty and classy! That's very sweet of you...thank you! Oh my goodness! Love the sparkle! Total WOW card, love it! WOW. Burmuda Bay and Silver. Beautiful. I would never have thought of that combination. Very striking. Thank you Diane! I was worried after posing it that I should have used more traditional colors. WOW this truly took my breath away....absolutely fabulous and thank you for sharing the idea!!!!!! Thank you Carol! I really appreciate the blog love! Absolutely Gorgeous! Stunning! Brilliant! Beautiful! Breathtaking! I love it....so very nicely done. Thank you. I really appreciate your sweet comments! Wow Beth! I love all of the silver accents. BEAUTIFUL!!!! Your style never ceases to blow me away. This card is stupendous!